FMEAs, or Failure Mode and Effects Analyses, play a vital role in today’s quality-centric organizations. FMEA goals align directly with the goals of quality control (QC) and continuous improvement (CI) objectives. FMEAs are often employed to aid in compliance with safety and quality requirements of standards such as ISO 9001, ISO/TS 16949, FDA Good Manufacturing Practices (GMP), Process Safety Management (PSM), and Six Sigma initiatives. In some cases, FMEAs are a required component of compliance standards. Even if not required for compliance reasons, oftentimes suppliers are required to perform and submit completed FMEAs as part of contractual requirements. In many cases, organizations adopt FMEAs as part of their own internal procedures in order to meet and improve quality objectives. Design FMEAs to assess and address failure modes during early or end stage product design. Process FMEAs to analyze and maintain process control objectives. Process FMEAs are often used in conjunction with Process Flow Diagrams (PFD), which detail the overall process flow, and Process Control Plans (PCP or CP) to document and maintain process controls. FMECAs, or Failure Mode, Effect, and Criticality Analysis, to combine failure analysis with quantitative criticality analysis. Various other FMEAs such as Manufacturing FMEAs to analyze failures in a manufacturing process, Service FMEAs to analyze failures in service organizations, Software FMEAS to analyze software faults, and others. At the most basic level, the significance of the FMEA process is to aid in quality control. Whether it is a product, a system, or a process under analysis, the goal is to evaluate ways to prevent, detect, and mitigate failures of any kind. In addition, it is important to point out the significance of controls in relation to FMEAs. It is easy to overlook because “controls” are not part of the FMEA or FMECA acronym, yet play a key role. 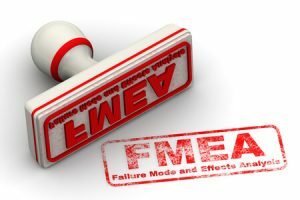 Though FMEA (Failure Mode and Effect Analysis) is aptly named, the critical “analysis” component contains many parts, all of which are crucial for FMEAs to be useful. What if your FMEA was considered complete once all potential failure modes and their resulting effects were documented? It would make a great list of items to worry about, but that would be about it! The analysis part of FMEAs implies the crucial element: how are my potential failures and the resulting effects handled? Usually, after defining failure modes and effects, the next step is determining which failures are most critical or catastrophic using some type of ranking system, and then spending effort on those deemed most significant. Ranking systems, such as RPN (Risk Priority Number) and other criticality measures, are available, or you can create your own. In some situations, organizations may even want to consider all potential failures. Once you have the list of items you plan to concentrate on, controls are then evaluated. Controls are separated into two types: prevention and detection. Essentially, prevention controls are controls put into place to prevent the failure from occurring, and detection controls are controls put into place to detect a failure once it has occurred. There is a significant distinction, of course, but the method employed depends on many factors: circumstance, cost, ease of implementation, etc. In Process FMEAs, controls are essential as one of the shared data elements uniting the PFMEA Worksheet and Control Plan. 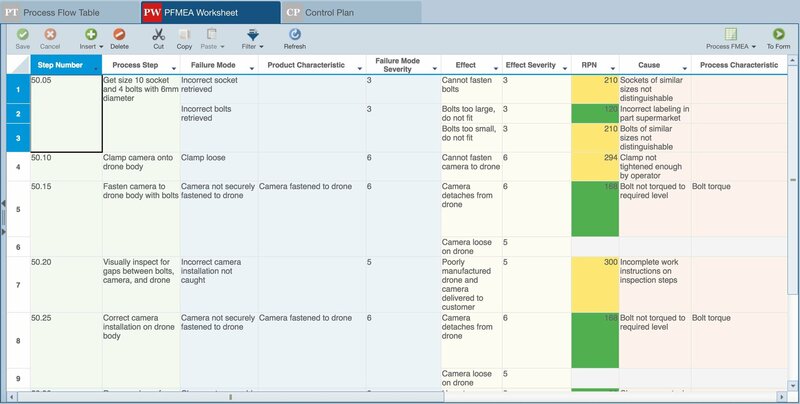 A Control Plan is an organized, detailed plan for documenting all the controls put in place to handle the failure identified in the PFMEA. Ultimately, a Control Plan is used to create operator instructions that are used to ensure your process remains in control and meets your quality requirements. Perhaps you are contractually required to perform FMEAs, or perhaps your organization performs FMEAs for internal quality control. In either case, FMEAs are valuable because they inherently support continuous improvement. No matter what standard you adhere to, or even adopt an ad-hoc approach, the FMEA’s value is not diminished. Team members consider actual or potential failures, evaluate their significance, and then discuss ways to mitigate them. The end result is a more reliable, higher quality product or process. All organizations care about the reliability, quality, and safety of their product, process, or system, for both their customers and their employees. FMEAs help you to meet and exceed your continuous improvement efforts. It is why FMEAs are often used in support of various standards related to quality, risk, and safety, such as ISO 9001 and Six Sigma initiatives. While there are many different analyses you can perform to aid in reliability, quality, risk, and safety assessments, FMEAs stand out more than others in their collaborative, multi-team approach. For example, analytical methodologies along the lines of prediction techniques, fault tree analysis (FTA), and Weibull analysis are often times done by a single analyst or a small team of engineers tasked with this effort. To be successful, FMEAs require cross-functional team involvement. FMEAs involve considering all potential failure modes, the effects of those failures both locally and at a system level, the resulting criticality of those effects, and then ways to eliminate or mitigate those failures. By the description alone, you can see how brainstorming and discussion are key components in FMEAs. Because FMEA are also used along all steps of the product lifecycle, from design to manufacture, this also means that all groups need to be involved. FMEA teams often include design engineers, analysts, process control engineers, manufacturing engineers, customer service personnel, as well as managers and other product team members. Relyence FMEA was designed and built with the three C’s of FMEAs in mind. Relyence FMEA supports all types of continuous improvement objectives, including those based on compliance with standards, or those unique to your organization. Relyence FMEA, and Relyence PFMEA most importantly, are designed to ensure all your controls are managed and organized. The value of Relyence’s always-in-sync technology means that you can rely on Relyence to keep your FMEAs robust and effective. Lastly, Relyence FMEA, as all Relyence tools, were designed with today’s collaborative, virtual teams in mind. Relyence FMEA is web-based, mobile-friendly, and device independent. 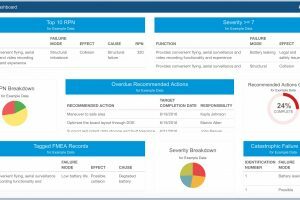 Your team is most effective when using Relyence FMEA. Relyence FMEA supports all types of FMEAs, including Design FMEAs (DFMEAs), Process FMEA (PFMEAs), Manufacturing FMEAs, Software FMEAs, Services FMEAs, FMECAs, and any custom-built type of FMEA you employ. Relyence FMEA also has built-in support for widely accepted FMEA standards such as SAE J1739 and ARP5580, AIAG/Six Sigma, and MIL-STD-1629. This enables you to get up and running in minimal time. You can modify any of the built-in templates to suit your needs, or you can create your own templates using the standards as a starting point. 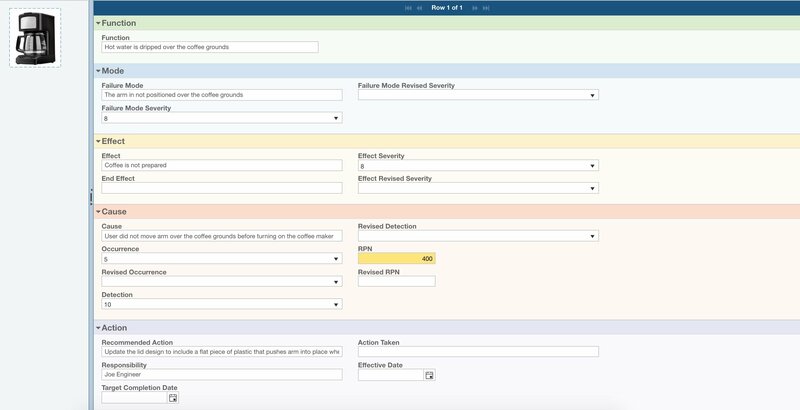 Relyence FMEA also supports multiple data views, so team members can create FMEA Worksheets to match the way they work. And you can modify your template over time, so you can adapt your analysis if requirements change. Relyence FMEA fully supports Process FMEA requirements with a complete start-to-finish design that incorporates Process Flow Diagrams, PFMEA Worksheets, and Control Plans. Relyence FMEA uniquely introduced the always-in-sync technology to ensure that your PFMEA process remains organized and in control. Data is shared across all your analysis elements and flows seamlessly throughout. You can register for a completely free, fully functional trial of Relyence FMEA. You are also welcome to contact our sales team for more details and to schedule your own personal live product demonstration.